Arizona’s attorney general has declined to take legal action to remove one of the state’s newest senators from office, citing a lack in clarity of state laws dictating appointments to office. The newest senator from northern Arizona brings a different perspective to the Senate, one that is in large part guided by an upbringing as a Navajo and the unique needs of the state’s rural areas. After four weeks and three meetings of a task force with intentions to reform, tweak, or overhaul Arizona’s personal income tax system, the members of the group don’t seem closer to deciding what, exactly, they want to accomplish. 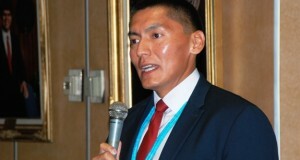 The chairman of the Apache County Board of Supervisors told county attorneys they shouldn't start a legal battle over Sen. Carlyle Begay’s qualifications to hold office. Rep. Albert Hale claims that Begay has lived in Gilbert, not Ganado, for the last seven years, and therefore can't represent Apache County in the Arizona Senate. Democratic Arizona senators, even those once interested in pushing for an ethics hearing into the actions of Sen. Don Shooter at a Yuma charter school earlier this year, now say it’d be a waste of time holding hearings on an issue that police and prosecutors have already dealt with in full.